Vandana: I am originally from Hyderabad, India and that was where I completed my undergraduate degree in Computer Science Engineering. I moved to Bangalore around 2 years ago to work on my startup dream and fell in love with the city. I have lived here since then. I’m a voracious reader and spend a lot of my spare time with my nose buried in a book. I especially love reading fantasy fiction. My favorite book/series is the A Song of Ice and Fire (Game of Thrones series) by George RR Martin. Accepted: What stage of the application process are you up to so far? Where have you applied to b-school? Vandana: I applied to 3 schools: Kellogg School of Management, UCLA Anderson and Tepper School of Business. Just last week, I received acceptances from all 3 schools. UCLA and Tepper have offered me generous scholarships as well. It’s very exciting to be accepted to all these wonderful schools, and I have a difficult decision ahead of me in the coming weeks! Accepted: Congratulations on a triple acceptance! What was the most challenging aspect of the admissions process? How did you approach that challenge and overcome it? Vandana: I think the most challenging part of the admissions process for me has been managing time. I work at a fast-paced startup and I work 6 days a week. Handling work, writing essays, managing my blog, attending info-sessions by various business schools, reminding my recommenders to work on my recommendations, helping people with their GMAT strategies…while at the same time making sure I had enough time for my family and friends was very challenging. I wanted to ensure that I didn’t alienate any one part of my life to keep up with everything else. I was able to overcome this by planning each day well ahead of time. I used a day planner to keep track of meetings and important dates, scheduled about 30 minutes a day to check up on my blog and respond to comments, set reminders to call and catch up with friends (especially during the commute to work) and I spent many a sleepless night making sure I was on schedule with my essay drafts and applications. I think this experience has been a great preview of what life at business school will be like, and has helped me prepare myself for the extremely busy (yet fun!) few years ahead. Accepted: A 760 on your first try – amazing! Can you share your top three GMAT tips with our readers? • Study from anywhere, but practice only Official GMAC questions. I simply cannot overstate the importance of this! I see people stressing about not scoring enough in MGMAT tests, or not getting questions from Princeton correct. I’d like to stress the fact that ultimately, GMATPrep exams (official tests found on the GMAC website) are the only tests that are true predictors of your progress and what your final score could be. I’d recommend that people study from whatever material they are comfortable with, but ultimately practice practice, practice from the official GMAT guides and any official questions they can get their hands on. I would recommend doing each of these books 2-3 times to get a handle on the different types of questions that could be asked in the actual exam. Especially in the last 3-4 weeks before your exam date, stick to past GMAT questions and official material. • Practice in timed conditions. The GMAT is tough. Not just because of the questions in it, but because a lot of us GMAT-takers haven’t sat for a test in a long time. It is difficult to maintain focus for the 4-4.5 hours it takes to complete the GMAT exam, and to prepare yourself for it, in addition to taking mock tests occasionally, I would recommend people to study and practice for the exam in timed sessions. It doesn’t necessarily have to be that every time you sit down to study, it should be 4 hours. When you practice focus on doing 38-40 Quant questions for 75 minutes (set a timer), then take a quick 5 minute break and immediately sit down and do a practice set of 40-45 Verbal questions in 75 minutes. It’s very helpful to do this as we automatically learn to pace ourselves accordingly and through practice, it is easy to keep your concentration and stay focused during the actual exam. • Maintain an Error Log. During the first month of preparation, I did not maintain an error log, and I really regret it the most! I found the error log on GMATClub most helpful for keeping track of my progress of OG 12, OG 13 and the GMAT Quantitative Review and GMAT Verbal Review guides. By keeping track of my progress and my mistakes, in just a few weeks, I was able to zero in on problem areas and then come up with a plan of action to tackle them! Accepted: What is your current job? Do you plan on staying in your current industry post-MBA, or changing to a new field/career? Will you return to India? Vandana: I currently work as a Product Manager for a global online entertainment portal. I love being a product manager, and I plan to stay in my current role post-MBA, but transition to a larger company in the technology space. I haven’t decided yet if I will return to India post-MBA. I think there are exciting opportunities available all around the world and I intend to travel a lot post-MBA to zero in on the place I’d love to settle down in. If that place is India, so be it 🙂 – but that decision has not been made yet. Vandana: When I was studying for the GMAT and thinking about applying to business school, I learnt from people’s experiences on GMATClub and read many, many blogs online from past applicants to get an idea of the applications process. After scoring a 760 on the GMAT, I wanted to help people nail their GMAT and I started answering a lot of preparation-related questions online on GMATClub and Quora. After a certain point, I couldn’t keep up with the volume of people getting in touch with me – so I decided to start a blog that documented my GMAT journey as well as applications progress in real-time. 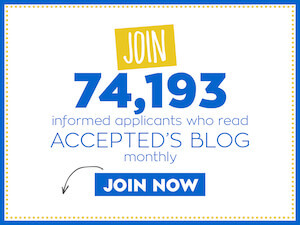 I hoped my blog would help prospective applicants navigate the admissions process better. Also, the blogger community is simply amazing! Soon after I started my blog, a lot of them added me to their blog roll, started following me online and encouraged me at every step of the applications process. Getting into business school is a marathon – GMAT, applications, etc. take up a lot of time; but time simply flew by since I had so many great people to share the journey with! I know I’ve made many friends in the blogger community and I’m hoping to meet them in person before joining business school. You can read more about Vandana’s b-school journey by checking out her blog, My Journey to Business School. Thank you Vandana for sharing your story with us – we wish you loads of luck! The story continues….check out our most recent interview with Vandana! Last updated on July 5, 2016.